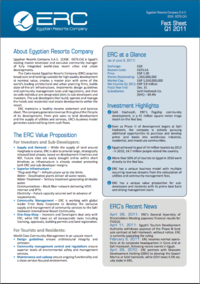 A summary of ERC's - Egyptian Resorts Companies' 2011 first quarter report, highlighting investment and industry trends. Egyptian Resorts Company S.A.E. (CASE: EGTS.CA) is Egypt’s leading master developer and exclusive community manager of fully integrated world-class resort cities and urban developments. ERC maintains a healthy income statement and balance sheet. The company generates revenue throughout the lifecycle of its developments. From plot sales to land development and the supply of utilities and services, ERC’s business model generates sustained long-term cash flow. This paper is a summary of the company's 2011 first quarter report, highlighting investment and industry trends. All whitepapers are available to you and free of charge. 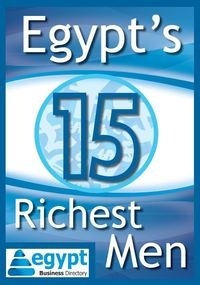 This whitepapers is provided by ERC - Egyptian Resorts Companies.